There I will be in my very own kitchen, it will probably be a little bit messy, with dished in the sink and one of those old fashioned (yes I will still have one of those) apple corer/slicers screwed to my kitchen counter. And there I will be with my blue apron on and my hair tied back. 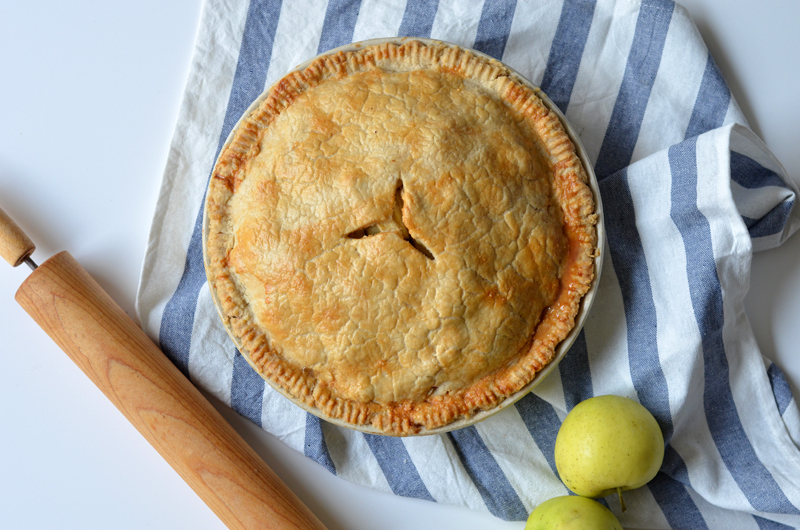 I will probably have some flour on my face or some left over cookie batter in my hair, but there I will be... Making this All-American Apple Pie. 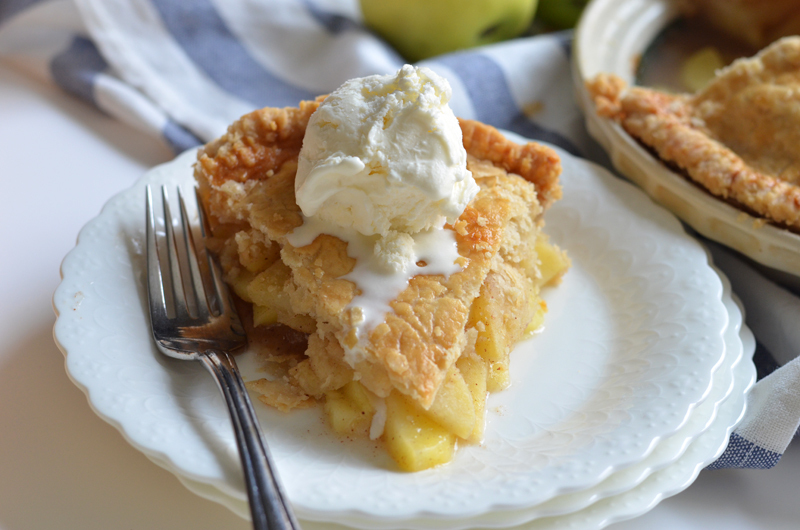 For some reason, this All-American Apple Pie is ALWAYS in this scene with me. It is the pinnacle of the american housewife. And someday (hopefully) that may just be me ;) But it's more likely to be me trying my best to get this thing in the oven and keep the little children from screaming hah! I'll all be worth it no matter what. 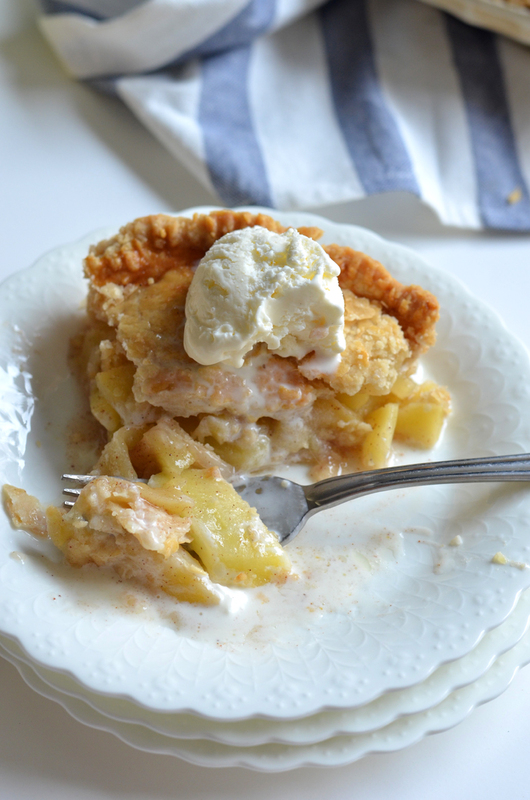 So, whether it's a dreamy (or not so dreamy) scene, this apple pie will always be there. Why? Because it is so dang good, that's why! 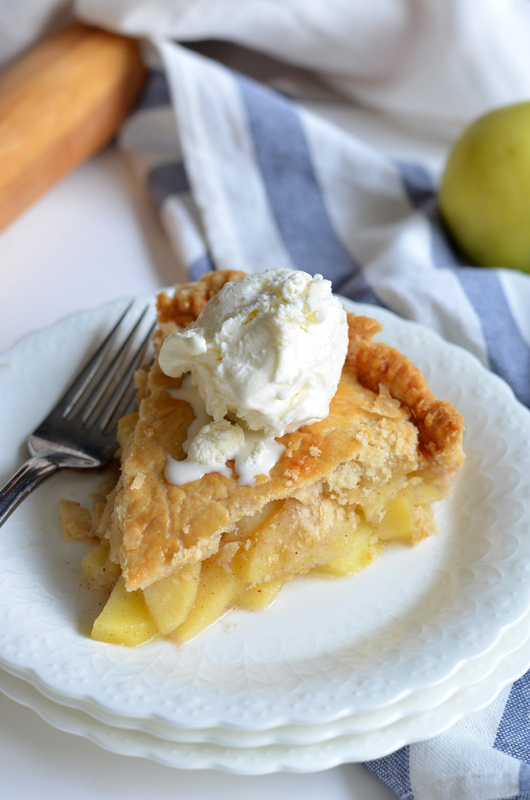 If there is anything better than this hot apple pie with a scoop vanilla ice cream melting down the top then let me know, but I don't think it's likely! 1) Peel and slice apples and place them in a large mixing bowl filled with some cold water and lemon juice (this keeps the apples from browning). 2) Drain all liquid from apples and add sugar, cinnamon, allspice, salt, and flour. Mix well to coat all apples evenly. 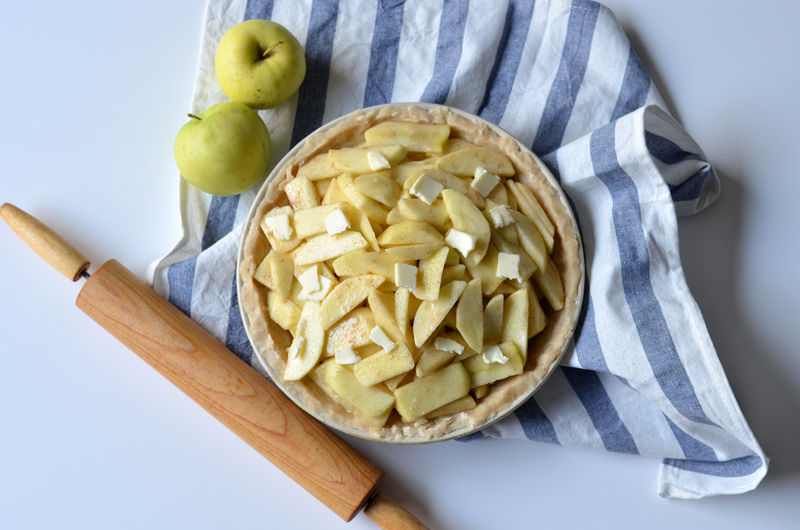 3) Pour all apples into a prepared pie crust and push down firmly (this helps apples settle as they cook). Dot with small butter pieces (see picture above). 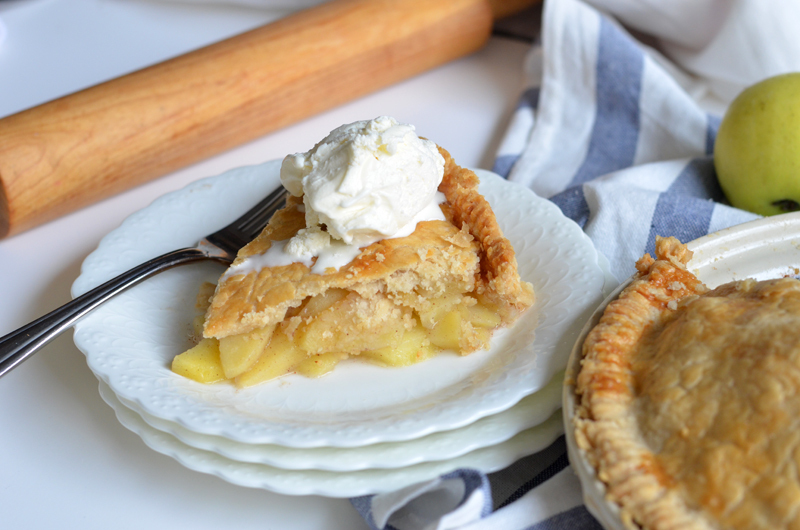 Cover with top pie crust and make a couple slices to let out steam while cooking. In a small bowl, whisk together egg and brush on top (we use this awesome Pastry Brush ). 4) Bake at 425° Fahrenheit for 20 minutes and then lower oven temperature to 375° Fahrenheit and bake for another 50-60 minutes or until apples are tender (insert a knife into one of the slits to check). 5) Serve hot, topped with whipped cream or vanilla ice cream (optional). Enjoy! Oh Gretta! These recipes make me happy :) Can't wait to try this one! 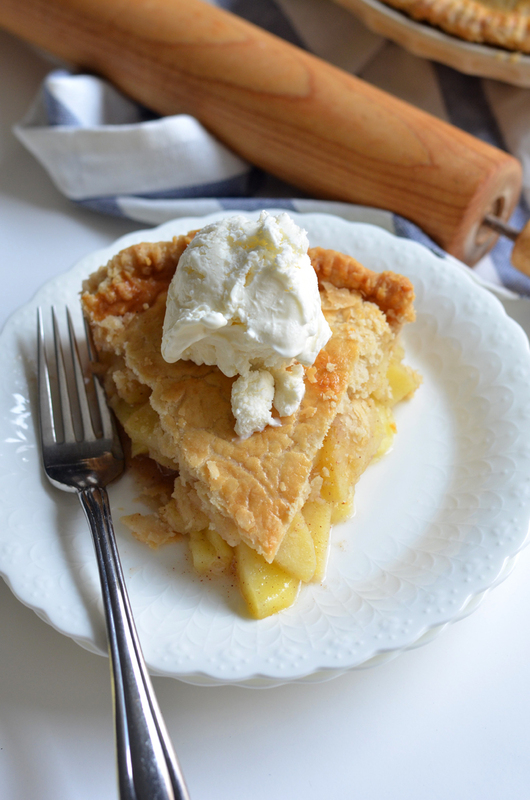 I think you need to post your pie crust recipe too someday!